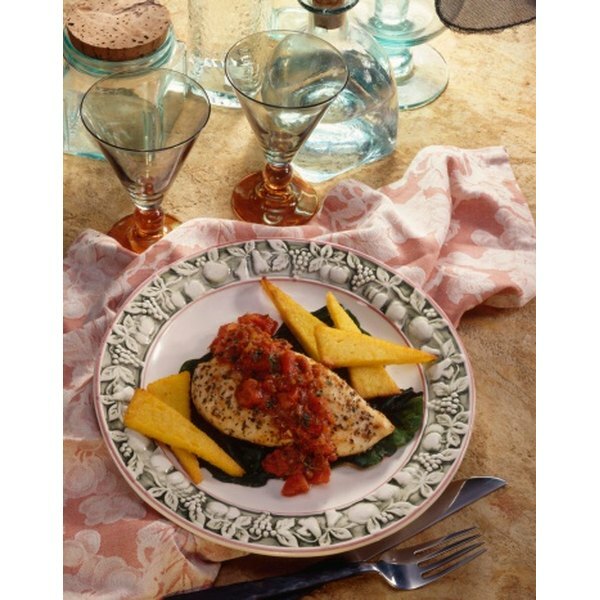 Serve chicken breast and tomatoes with polenta and steamed greens. Boneless, skinless chicken breasts are versatile. They come in single-serving portions and can be cooked in many different ways. Chicken breasts combine well with many different kinds of seasoning, so that you can have Mexican chicken one night, Asian chicken another night, followed by chicken salad and then Southern chicken with gravy and vegetables. Tomatoes are just as adaptable, and are used in many different cuisines. Baked chicken with tomatoes can be spicy-hot or subtly flavored and complex. Depending on the spices you choose, serve baked chicken and tomatoes with pasta, potatoes, rice or polenta. Rinse the chicken breasts and pat them dry. Season generously on both sides with salt and pepper. Heat the skillet over medium-high heat and add the olive oil. Brown the chicken breasts on both sides, about 2 minutes total. Remove the chicken breasts to a plate and set aside. Saute the onion, garlic and bell pepper for 2 minutes, then add the tomatoes, thyme or oregano, bay leaf and red pepper flakes. Cook over medium heat, stirring frequently, until the mixture is bubbling. Return the chicken breasts and any accumulated juices to the frying pan with the tomato sauce. Bake in the oven until the internal temperature of the chicken is 165 degrees Fahrenheit, about 10 minutes. Measure the temperature with an instant-read thermometer inserted into the thickest part of the breast. Discard the bay leaf before serving the chicken. Add cumin and coriander for a Mexican-inspired dish. Garnish with lime slices. Add basil for an Italian inspired dish. Garnish with Parmesan cheese. Add diced eggplant, zucchini or roasted red peppers for more texture and flavor.